The Mineral Wells Fossil Park is one of our hidden gems that is a unique family friendly experience. In 2010, the Fossil Park was opened to the public and provides its visitors an experience they won’t forget. The park as it exists today is a result of 20 years of erosion of the old City of Mineral Wells landfill’s borrow pit, which was closed in the early 1990s. 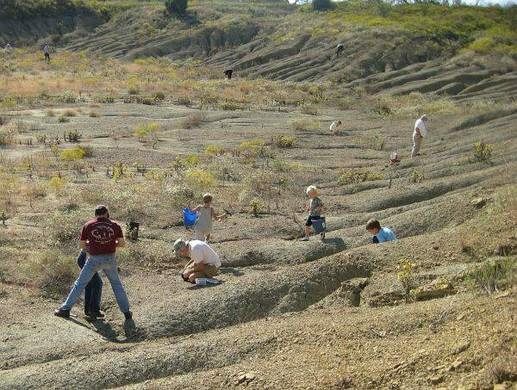 The erosion of the borrow pit has revealed fossils documenting ancient sea species such as crinoids, echonoids and other historic sea life from the Pennsylvania Period- over 300 million years ago. What is special about the park is that visitors can take what they find home with them and there is an abundance of fossils to choose from. The park is now open Friday – Monday, 8 am to dusk. Admission is free. Once you arrive at the park, follow the trail near the covered canopy area down to the hill to the borrow pit, which will be on your left. Just note that fossil collecting is allowed in designated areas only and only surface collecting is allowed with small gardening tools. Click here for official park rules. The dig site is fairly large and finding fossils may require some exploration, but the fossils you will find will be time well spent. Once you complete your dig, head back up the hill and use the fossil reference sign near the entrance to identify the types of fossils you have discovered. The Minerals Wells Fossil Park is a great place to explore your inner paleontologist as an adult or child. We suggest you bring some knee pads, gardening tools and some plastic bags for your fossil discoveries. The fossil park is not equipped with water, so make sure you bring a water bottle or two. Happy fossil hunting!